A surprising number of dogs suffer from separation anxiety when they are away from their owners. And no matter how much most owners love their pets, its practically impossible to never leave your pet alone! When such dogs are left alone, they often get very nervous and anxious. We recently discovered that there are some beds that are particularly good for dogs with separation anxiety. One such bed can be made to smell like their humans, so the dog feels much calmer. It is kind of a half pillow, half blanket, where you can put in an old pillow that you have used so it smells like you. By the way, a high-tech dog product that can really help if your pet suffers from separation anxiety is a pet camera. These devices are catching on rapidly, and can help you communicate via audio/video with your pet when you cannot be near them. One feature-rich one is the Petchatz camera. How do you pick a bed for your dog? Picking a perfect dog bed depends on your dog. Dogs may not speak about their “sleep number”, but you can use your dog’s size, habits and age to get an idea of what will suit the dog. It is also important to think of what you need from a dog bed and the money you are willing and able to spend on the dog. This can help you pick a perfect bed for your dog. Evaluate the age, size and health of your dog. How long have you been with your dog? If you have been with your dog for several years, then you know your dog. So, think of a bed that is comfortable for your dog. If you have an older dog, you may not want a bed that is too high to jump into. You may even want to consider an orthopedic bed. Small and toy breed dogs love beds that they can snuggle in. These beds are known as Donut Dog Beds or snuggle dog beds. A pillow bed is a good choice for a maximum lounging and cushy feel. Check the covers of the dog bed before buying it. Are the covers removable? Are the covers washable? Pick a dog bed with washable covers, because the covers will get dirty over time. This saves you money, because you won’t have to buy a new dog bed when the covers get dirty. You just remove the covers and wash them. For example, dogs-n-u.com dog beds have washable covers. You may want to think of what you wan the dog bed to look like. You may want custom dog beds, or you may want something that goes well with the aesthetics of your room. But in our opinion this is far secondary to the functionality of the bed and how comfortable it is for your dog. The color of the dog bed is important. Pick a color that matches with the overall “look” of the room that will you use to keep the bed. The good thing is that there are so many fashionable options to choose from. Choose the right color if you don’t want to hide the dog bed when your friends are coming to your house. Remember that the dog bed will stay in your house for several years. How much are you willing and able to spend on the dog bed? There are cheap and expensive dog beds. In fact, this is where you need to start. While you want to pamper your pet, staying within your budget is very important. Knowing the amount you are willing to spend helps in picking the right dog bed. You won’t have waste your time going through dog beds that you cannot afford. It will save you time and you will choose a perfect bed for your dog. Buy a dog bed that is right size for the dog. The dog should never hang off the bed. It should lie flat and completely stretched out on its side. Most people love snuggling with their dogs in their own beds. However, sleeping with a dog may lead to a poor night’s rest. And you will be less productive if your sleep is interrupted. The best thing that you can do is to pick the right bed for your dog. Use the information in this article to make the right decision. 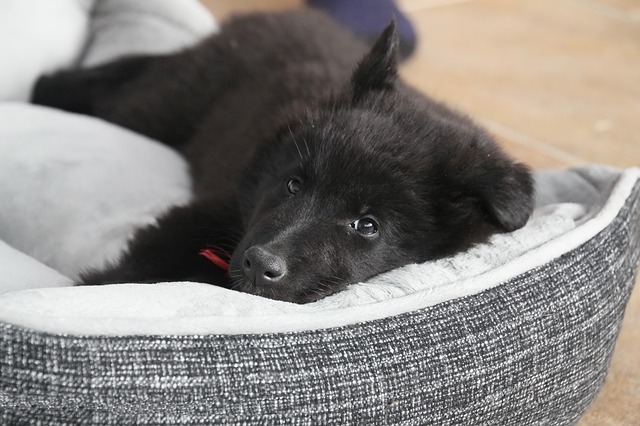 You may be surprised that we are asking you to choose your dog’s bed with care. After all, you are thinking, your dog just has to sleep on something somewhat warm and comfortable, and that’s it, right? That couldn’t be further from the truth. Many dog beds are specifically made for senior dogs. They are easier to get in to and get out of, and are more supportive and orthopedically friendly. What is your dog’s size? Do you have a miniature breed? Or do you have a Great Dane? The bed’s size will of course vary dramatically based on the size of your dog. How does your dog like to sleep? Some dogs like to cuddle up against something and sleep, while others like to stretch out all the way. Does your dog have any specific health issues? Maybe you have a young dog, but he or she is troubled by hip issues, or some such. In such a situation, you may still want an orthopedic bed or a low-set bed for your pet.